Yang Liping is the director, choreographer and star of a show called "Dynamic Yunnan" that is drawing sellout crowds all over China. She is expected to travel to Europe and the United States in 2005. 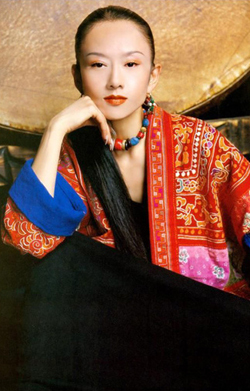 One of China’s renowned dancers, both at home and abroad, Yang Liping is from the Bai ethnic group. She has won a reputation for being the Spirit of Dance due to her charming performances, such as The Soul of the Peacock, Two Trees, and Moonlight. Although born in Dali, at the age of nine Yang moved with her family to Xishuangbanna. Because of her extraordinary gift, she was chosen to join the Xishuangbanna Song and Dance Troupe when she was 13 years old. She became famous overnight for her performance in the Dai dance drama, The Peacock Princess. 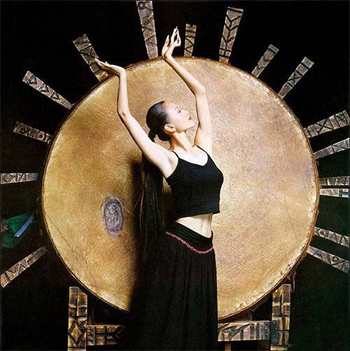 In 1988, she entered the China Central Song and Dance Ensemble of Nationalities. At the Second National Dance Contest, her dance The Soul of the Peacock, that she choreographed and performed herself, outshone all the other dances and reaped two first prizes, one for choreography and the other for her performance of the piece. A shining star was on the rise. Since then, she and her dances have been frequently shown on TV. Yang’s dances boast a lyrical touch, which often abandon trivial realities and meretricious expressions. What’s left in her dances are various moves that form silhouettes of a tree, a fish, a bird, or a snake against the backdrop of a moon as depicted in her dance Moonlight. It is said that Yang, with her dances, invites audiences to journey to a fairyland with blooming flowers, singing birds, and running beasts. She gives life to those creatures with her emotional and expressive body language, and communicates with them. No speech is needed in dance. She rarely separates her everyday life from the world of dance. Yang is a taciturn person, and finds it difficult to communicate with others. When she does speak, she mostly speaks to herself; and what she says usually concerns dance. This is Yang Liping, who lives for dance.